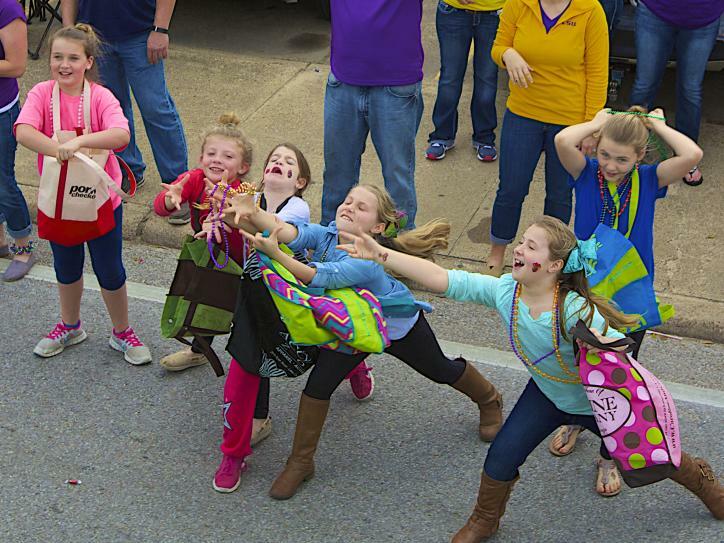 As a Yankee transplant to Louisiana as I have often commented, one of the greatest revelations upon moving to Louisiana 10 years ago was learning that Mardi Gras is not a single day, but a season. By the calendar, we celebrate this cultural holiday from January 6 (Twelfth Night) until Mardi Gras Day (also called Fat Tuesday or Shrove Tuesday) with parties, parades, and a myriad of traditions. In reality, Mardi Gras is a spirit of joie de vivre that lingers in the hearts of Louisianans long after Fat Tuesday. I find the mysteries and customs of Mardi Gras fascinating. I’ve been to all the various parades, the gumbo cook-offs, even a Mardi Gras ball. But until last year, I’d never ridden on a Mardi Gras float. I lucky enough to ride in the Merchant’s Parade as part of a local business. 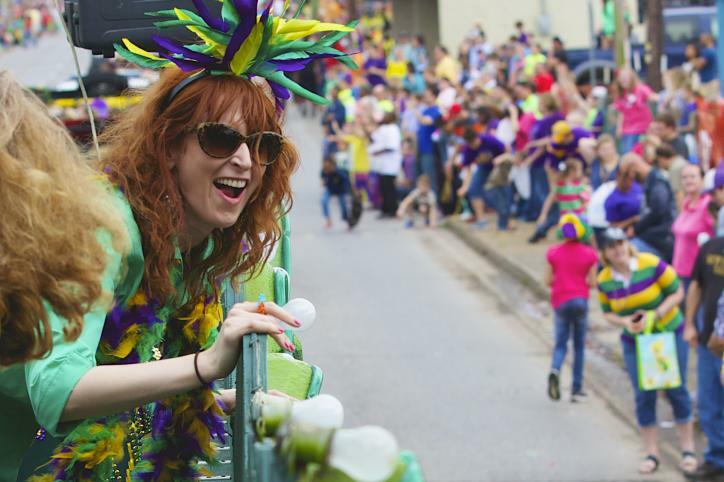 Participating in a Mardi Gras parade from atop a float is a completely different adventure than being a spectator. Watch a parade from street level and you participate in an interactive cultural experience. An unrehearsed theatrical production. A mobile stage set with streetlights, crowded sidewalks, blaring music and general merriment. You never know what you’ll see! Float riders are on the stage, entertaining the masses. Both riders and revelers are an integral part of this once-a-year production. My inaugural float ride provided an exciting different perspective, looking down at the throngs of parade-goers who call out, dance, and wave their arms in hopes of catching strands of beads and trinkets. I have no idea exactly, but it felt like I tossed a thousand strings of glittering green, gold, and purple beads that evening. I’m all about experiencing Louisiana from as many different angles as possible. From atop a float, I added one more vantage point to my list. 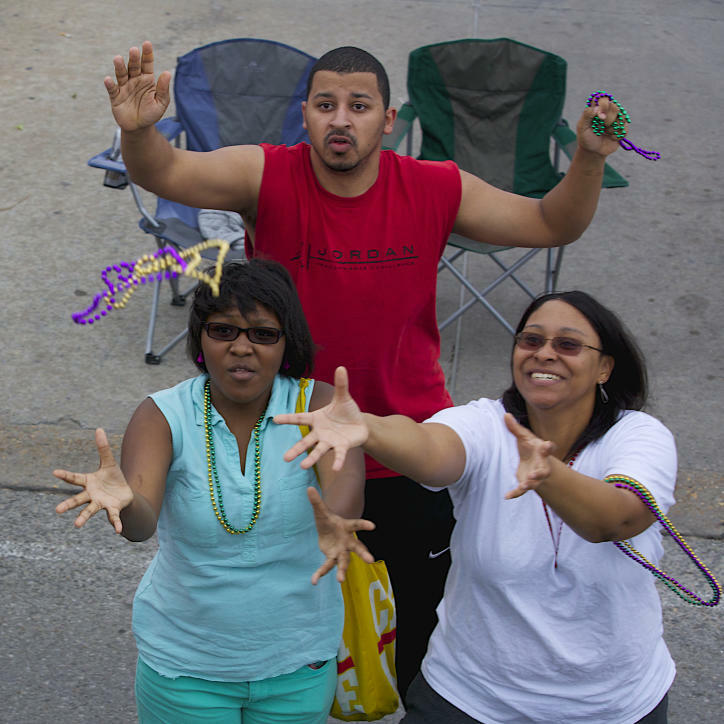 Check out this video of bead throwers in action, courtesy of Carole Terwilliger Meyers. You can watch more of Carole’s traveling videos on her YouTube channel, http://www.youtube.com/traveluv. If your local business would like to participate in the Merchant&apos;s Parade, visit www.swlamardigras.com to fill out the entry form and paying a nominal fee. 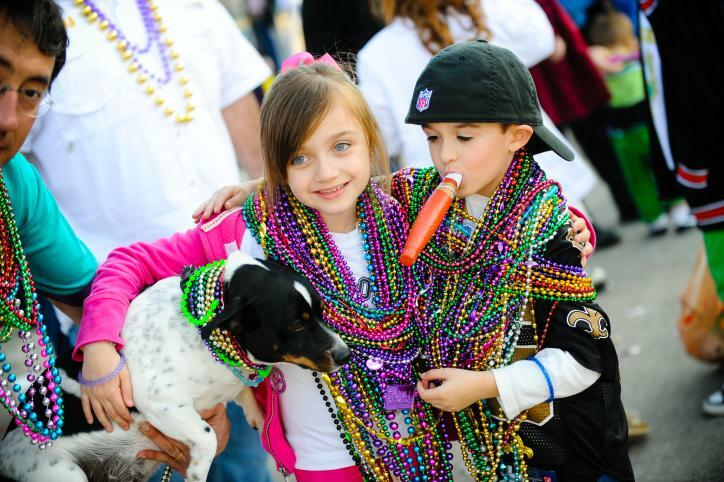 To experience other fun and exciting Carnival events, check out www.swlamardigras.com for a full list of celebrations!